Chowder House is the brainchild of Rich Clark and Jonathan Schwenk, co-owners of C&S Seafood and Oyster Bar and Hugo’s Oyster Bar. Clark and Schwenk's third concept will focus on traditional northeastern seafood with a New England style décor. Chowder House strives to deliver a vast selection of high-quality oysters, an array of clam chowders, and traditional dishes such as, steamed clams, lobster rolls, lobsters and steaks. 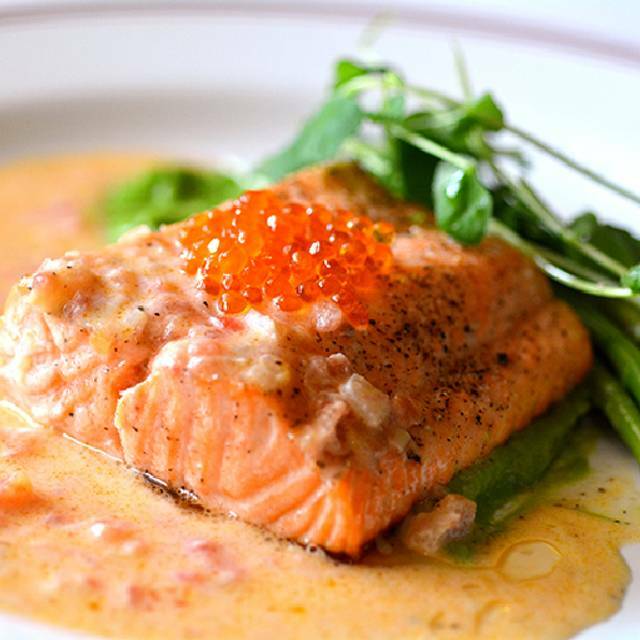 The restaurant will also offer a seasonally rotating market fish menu, cooked to each guest’s preference. Chowder House promises well-crafted signature cocktails to compliment the classic American cuisine, along with a wide-ranging selection of wines and craft beer available on draft, in bottles or cans. Chowder House will be open daily for dinner, with brunch offerings on Saturday and Sunday. Ask your server about taking a Pint: $10.50 or Quart: $20 of our housemade soup home today! We went to C&S to celebrate a special night and man did they hit the mark helping to make it special! We also had a new waiter was excellent! Can't say enough! Greta seafood and ambience. Best New England clam chowder outside of Boston! Great Food and very hospitable staff. C&S Chowder House was an incredible experience. We utilized the OpenTable app, and secured a 6 pm table on a Friday night. 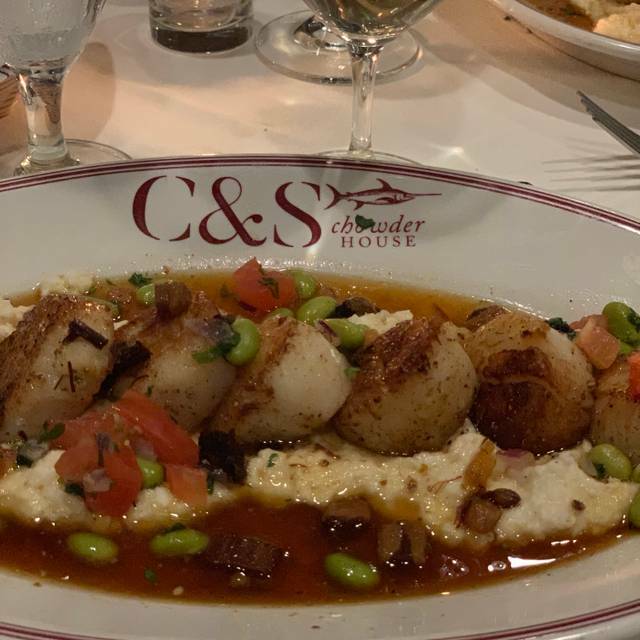 My wife and I really enjoyed eating at Hugo's so it was only natural to broaden the experience with the sister restaurants...Now this is the second of the three, the last hurdle will be the C &S Seafood and Oyster Bar. the wife ordered the Scallops and Grits with an unusual Edamame Pico... Which was Scrumptious. My entree, the Blackened Grouper, light flaky juicy with an incredible Buerre Blanc which was laced with chunks of Jumbo Lump Crab, over a jasmine rice blend. (Honestly, i thought it was a bit dry and flavorless.i would have opted for a Fried Green Tomato Polenta which then would be grilled. That would help round out the Cajun flavors with a touch of jalapenos. 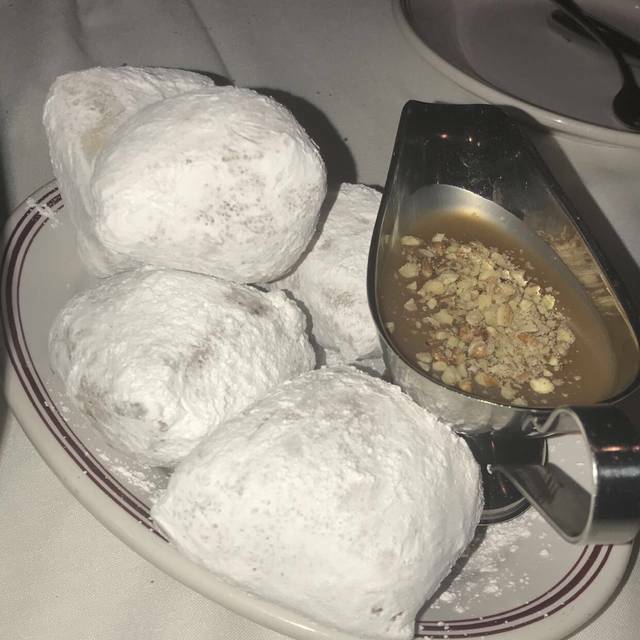 The finale, consisted of a surprise dessert which was their take on Beignets supported with a side goose-neck with caramel pecan sauce. loved the drink and the staff... Ill be back! AMAZING!!! The Chowder was the best I have had definitely on par with the Chowder I experienced in Maine. Atmosphere was pleasant as we dined with some friends from the area we see occasionally.We are visiting from Ohio and thoroughly enjoyed this place. The owner visited our table and was a joy to talk to. Highly recommend and plan to revisit when in the area. Excellent food and service. Lobster may have been slightly overcooked . Chowder and oysters outstanding. We went to C&S for Clam Night on March 29th. The service, food and the attention from management made the night for the nine of us a great event. For two of us we have been there many times. For the remainder of the group they had never been but absolutely be back. This is a neighborhood gem! Very good chowder. Atmosphere was good. Service a little pushy, we wanted to take some time to enjoy drinks and waitress asked us every couple minutes if ready to order entrees - felt as though we were being pushed so they could turn the table. Would go back again as overall experience was good. always LOVE this place! This time I brought someone who had not been there before, so much fun to watch her face as they brought the food! Yum!! Server was kind and attentive but when we asked questions she would lean over and read our menu. We can read, that wasn’t helpful. When asked if chef could prepare a veggie entree server asked and said no. Order off menu. Later manager came over and inquired, and we mentioned the lack of vegetarian options. He said, you should have asked, chef would prepare pasta w veggies. We said we did ask! Manager immediately had pasta made for us, which was very nice. So we would go back. Enjoyed the flounder! We arrived at 4:30 for an early dinner after theatre. There were few diners as it was early. The music was so loud we asked the waiter if it could be lowered and he requested it although it was still prominent. It became overused. Suggest waiters have a few alternative responses...but he was a good waiter nonetheless. Not an inexpensive dining option...will use for special occasions but prices rule out frequent returns. Service and food is always exceptional!! One of our favorite dining places. Saturday night was a little more noisy than usual. We guessed everyone was excited to be dining at C&S Chowder House!! Shared 7 or 8 of the small plates with three friends and all were great. The mussels in particular were superb. Good selection of fresh fish. Wine list offers good selections, but is pricey. This place is very popular, so be sure to make reservations. This has become a local hangout in the Crabapple area, so it gets loud. Probably the best restaurant in the Crabapple area right now. It was a great choice, I am glad I took my friends there, they loved and they will go back, as well myself with other friends and clients. We had a reservation for a party of 9 and the table was too small- the manager came over right when we were sat and apologized and he knew it was too small and said as soon as the table next to us left he would attach their table for two to ours but they were only on our salads. Although the restaurant emptied- they never gave us any more seating and it was very uncomfortablLe. Wouldn’t eat here again unless we had a table of 6 or less. Best sea bass in Atlanta - period! Great drinks and seafood experience. Variety of oysters to choose from. Great place for fresh seafood! Fantastic! The service and food were exceptional. Great location, easy parking. Everything we ate was delicious. Will be back soon. Incredible restaurant. Patrick the Manager great and so is Freddie the Waiter. Family in from out of town. Had heard good things. Food was good. Portions were small. Server seemed irritated at having to serve our party of 8. Unfriendly and not smiling. May go back but only one more chance. Great mussels, good service. I would recommend this place. Service is excellent and food is delicious! We will return! Food is always good with a great environment. Nothing matches it in the Roswell/Crabapple area. Delicious food! Friendly, courteous staff! Try all of the chowders, the lazy lobster, the beniets and the blueberry pound cake!! We’ve eaten here on several occasions and have always enjoyed the excellent seafood. Great menu. Happy to hear they had soft shell crabs tonight, but wish they had the fried clam strips available. They are out of this world as are the mussels and chowder. Our waiter, Jared, provided excellent service and was very personable. He even remembered us from a recent visit!! I’d definitely recommend this restaurant and we’ll be asking for Jared the next time we are in. One of our frequent dinner spots. The food was great as always and our server was very attentive. We will be back and recommend C&S Chowder House. Great Food / Oysters !!! They went above and beyond our expectations. 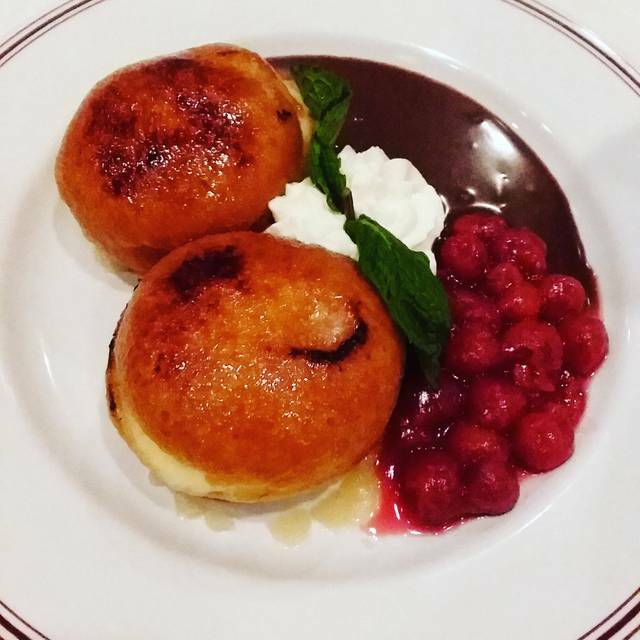 We continually try new restaurants, and rate them by if we would return or would we recommend to others. They accommodated our wish to try many menu items in small portions, food was delicious, nice atmosphere, noise level is important and this was just right. We had such good food and a wonderful experience. We will definitely recommend this restaurant. Very noisy, poor service, good food though. The clam chowder was excellent—maybe best ever—but the rest of the experience was lacking. While we think she was trying to be friendly, the waitress was loud and a bit abrasive. She had on way too strong of a perfume. And you could tell every time she had been out for a smoke break by the smell. The wrong food got delivered to the table which was quickly rectified. The oysters were small in number and small in size with lots of breading to try to make it look bigger. The salmon and the tuna were good. But overall, overpriced for the entire experience. With tip for 4 people, bill was 150.00 (no dessert or coffee). Lively atmosphere with a great selection of NE seafood! Looking forward to returning. The food was amazing! I really want to come back and I hope that the service improves. We were there on a Saturday night at 7:15. It was very busy, but we didn't get food until 8:30. Our waiter would disappear and then couldn't believe we didn't get our food. He was delayed in getting everything including ice tea. I think the bar tender noticed that we were getting frustrated so all of a sudden he brought over 4 glasses of champagne. 5 starts to him! I will definitely go back because the food was very tasty. We were served by Jarod and while he was a good waiter, attentive and got our order correct...he did not smile once. He looked like someone who had lost their best friend and it impacted our experience. I’m sure his tips would increase if he made the customer feel like he wanted to be there. Harry and Freddie were fabulous. There was a slight mix up with our reservation but Freddie stepped in to make certain we were handled with perfection. Harry was the most attentive waiter we have had in a long time and made the evening enjoyable. Food was fabulous from start to finish. Highly recommend.